Every so often, I stand somewhere, somewhere pretty random - though often somewhere quite pretty too - choose a foot and, while making sure not to move it or lift it, take pictures of whatever I see. I can zoom up and crouch down, twist round - but must keep to the discipline of staying in that one place, with my foot stuck to the ground. Hence, every so often, a stuck foot post. My bane is blackberries. 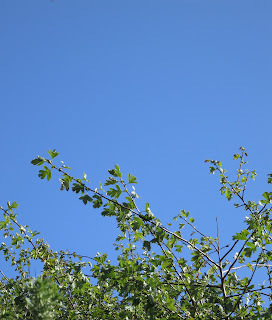 Here are some blackberries against the blue, blue, puffy cloud sky of Tuesday afternoon. Sometimes, life is hard! Oddly, there are lots of haws on one side of the path but not the other. 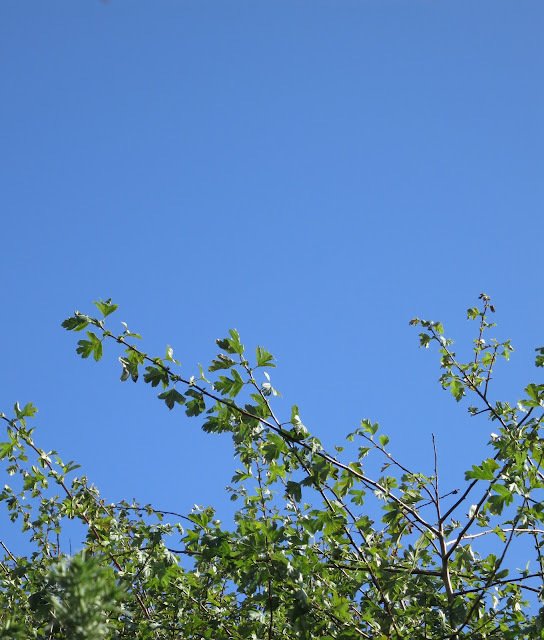 When I was standing there, with my foot obstinately stuck, the sun glared milkily into the lens when I pointed it at them - so I stuck to hawthorn leaves against that blue, blue sky. The gorse was popping. It's been such an odd summer, this is the first time I've heard it. Not these high, green branches. They weren't popping - only the old brown pods. You don't get to see them for I would have had to move my foot to take their pictures. This was poking up above the hawthorn trees and brambles. Seems to be a young sycamore. I hadn't noticed it before. Brambles, brambles, interminable brambles. I thought this was a strand of wild rose when I took the photo but it isn't is it? Yet another beautiful, bright green trail of blackberry, reaching to the sky because it is new. The moment will come when it grows too long to support itself and it will bend back in a graceful ark. Oh, it's a hard life, isn't it!? Hello Janet. It's the foot which used to have a red shoe on it - until the red shoe fell apart and only black were available. Now the black is falling apart so will have to try for red again. Hadn't thought of that! Lovely pictures Lucy, I like the premise very much. The new red shoes could have a whole blog to themselves. Yum blackberries. Do you pick them and make jam? Our daughter does and she just made jars of it for winter. Hi, Toffeeapple. It's surprising what you don't have to look for when you stand still. Hello Janet - a red shoe post? If I get new red shoes, I'll give it a go! Hi, Linda. We pick and eat lots of blackberries. In years when they have been specially nice and plentiful - my lunch has sometimes been to walk along the bushes, eating as I go. Blackberry and apple crumble is also a family favourite. I used to make a lot of jam (and preserve blackberries in jars) but in the last few years I've been busy at the wrong moments. Hi, Woody. If you do do a stuck-foot post, let me know and I'll put a link to it from Loose and Leafy. Crikey; a year's supply of blue sky all in one post! I like the somewhat offbeat post title. Blue sky galore, make the most of it as I'm sure that it won't last. through your lens we see so much of what we take for granted, Lucy. Blackberries a disappointment this year but still photogenic. Hi Mark. Making the most of blue skies while we have them! Today (23rd September 2012)they are overcast and the rain steady. Hello Flightplot. I do these stuck-foot posts from time to time. After a few more, I expect the title will seem right-on instead of off-beat. Sunflowers - I agree. Against a sky like that they are magnificent. Very heart-lifting. Hi Patio Patch. I expect that, for all the excitement which would be generated by flying skyscrapers, I should hope yours will remain static. Our blackberries are varied. They are ripening now and some are delicious. Others are tasteless. Others sour even though apparently ripe. You can't tell which one is which without tasting. Frustrating. Everyone - you might like to know the latest Loose and Leafy post has just gone up. It's a celebration of haws (hawthorn berries).